As a bander I often get to see many weird things in the birds we catch that might otherwise go undetected just by glancing at a bird in a tree. 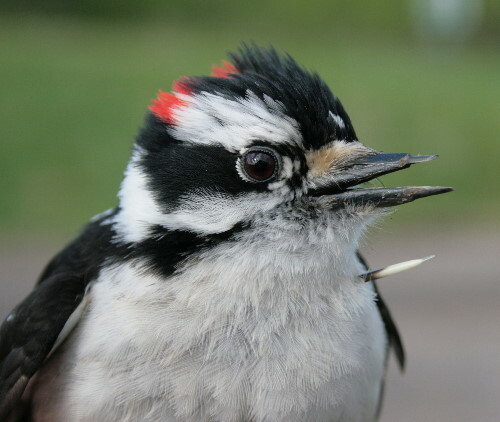 Today we caught this Downy Woodpecker who had, at some point, had a rather unfortunate run-in with a porcupine. This is something I’d never seen before: a wild bird that had been jabbed by a porcupine quill. Even stranger was that the bird in question clearly was not a species to have any interest in the porcupine as dinner. My hypothesis is that the porcupine, during the course of its foraging for leaf buds, got a little too close to the Downy’s nest cavity, and the Downy, raging with hormones as he is at this time of year, would have perceived the porcupine as a threat and tried driving it away. Interestingly, this wasn’t the first misfortune to befall this bold little guy in the 11 months or so since he hatched from his egg. At some point in that period he’d also managed to break off a portion of his bill. Goodness only knows how. It was still regrowing, but given his good health it didn’t seem to have adversely affected him too much. Wow..poor fella, bet he felt good after the quill removal..
Amazing! Great post. It ain’t easy being a bird. I think this fellow should be quarantined in rehab for his own protection. He’s just not sensible. With any luck, you will find a porcupine with a bit of downy bill sticking out of it. Do not try to remove it. My goodness! I never would have expected to see something like that! We had a quill adventure this week…my little dog found a baby porcupine…and ended up with a snoutful of prickles. Ouch, indeed! Interesting find! Poor guy. I’m glad you mentioned their beaks re-grow after being broken. This spring I encountered a female Yellow-shafted Flicker with her upper break broken. She seemed to be foraging just the same and I hoped it would repair over time. Amazing! Mother Nature never ceases to provide us with new and stunning material. great article, thank you for this information. glad that you had someone who had done wildlife rehab when you found this bird!